Those of you who have been to Venice will probably instantly recognize the bridge in the picture above. 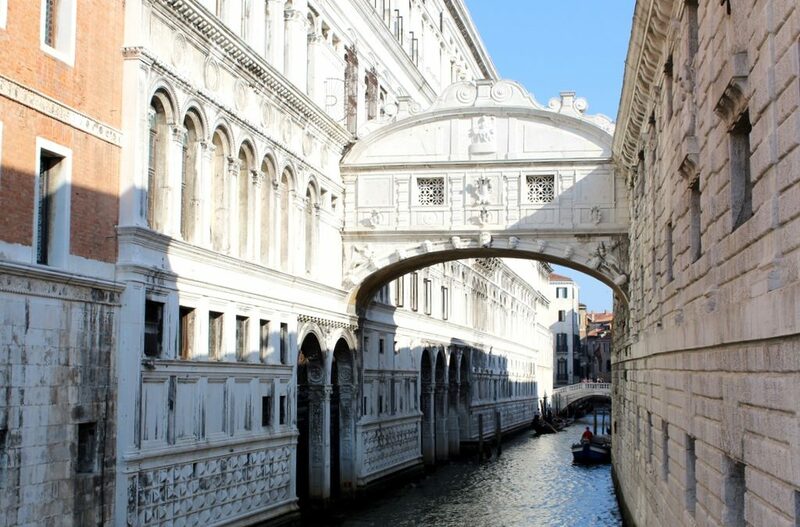 It is the famous Bridge of Sighs, or Ponte dei Sospiri in Italian, one of the most famous and photographed bridges in Venice and one of the city’s main tourist attractions. How Did the Bridge of Sighs Really Get Its Name? The origin of the name is much less romantic that you might think based on how it sounds. This small, covered and highly ornamental bridge connected two buildings: the magnificent Doge’s Palace, which was home of the Venice’s ruler and also housed the Courts of Justice and the Prigioni (the prisons) across the canal. As the convicts were being led across the bridge from the Court of Justice to the cold, damp and dark jails, the view from the bridge was the last view of Venice and the outside world they saw before their imprisonment. Their sighs were the last breath of the free world because there was little hope they would ever make it out of the prisons again. Not that romantic, right? If you are a hopeless romantic like me, don’t be dissapointed. 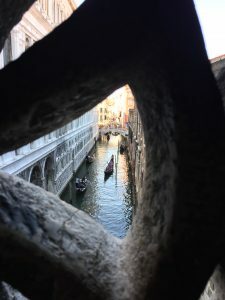 There is a romantic legend associated with the Bridge of Sighs after all: if lovers kiss under the Bridge of Sighs at sunset, sitting in a Venetian gondola while the bells of Basilica di San Marco ring, then they will be granted eternal love and happiness. You should know, that it is not exactly easy to do this, because San Marco’s bells don’t ring every hour like most other European church bells. Well, neither is finding eternal love and happiness, it takes some work. But I digress. Most importantly, many couples still enjoy a smooch in a gondola as their gondoliero gently glides them along. Che perfetto! … and to the south. These days, it is only tourists enjoying it. The Bridge of Sighs was built in 1602 and is one of 400 bridges in Venice. Made out of Istrian stone, it is considered one of the finest baroque bridge architectures in the world. The outside has beautiful carvings of happy, sad and angry faces, apparently intending to ward off evil spirits and protect the bridge. Inside the bridge are two passages separated by a wall and barred stone windows (you can see them in my two photos above). You can only see the inside of the bridge if you go on a guided tour of the Doge’s Palace. The most famous person to walk across the Bridge of Sighs was Casanova, however, he is said to have escaped the prison after 15 months. What else would one expect from Casanova? If you want to be awesome and original, you can count on being copied. Several other cities in the world have their own versions of covered bridges connecting two buildings, inspired by the Ponte dei Sospiri. In England, the university cities of Oxford, Cambridge and Manchester in England all have their own versions. There is also one in Frankfurt, Lima, Stockholm and even here in the U.S. (Pittsburg’s Allegheny County Courthouse). 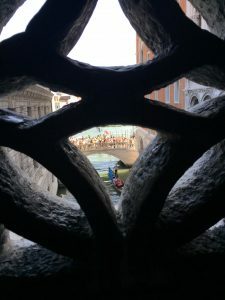 “So what lessons can we learn from the Bridge of Sighs?”, I asked my kids after we were done with our Walks of Italy tour of the Doge’d Palace which included a walk across the Bridge to see the prisons. Things are not always what they seem. Challenge yourself to look beyond the obvious or from another angle. Things are not always what they seem. Or in this case, sound. Challenge yourself to look beyond the obvious or from another angle. Ask questions in order to confirm assumptions. Nice one, kiddos! Traveling allows you to learn all kinds of cool and memorable facts about the places you visit. If nothing else, it will make you a smarter and more interesting person. And speaking of “awesome”, despite being touristy, Venice is totally awesome. If you haven’t been, you should plan a trip there.